Published on December 31, 2010 in General T&T, Media, Passed on and Politics. 24 Comments Tags: Ellis Clarke, President. Deepest symphathy to the family. Sir Ellis lived to a ripe old age. He enjoyed much of life and his passing is a celebration of life. A life lived in the public eye. A life of service to the nation…. May he rest in peace. The Success of the Trinidad Tripoli Steelband was heavily shaped by the astute advice and actions of this true World Citizen we are so proud and blessed to have had his friendship..Thank you from all of us R.I.P. Sir Ellis E.I.Clarke. of Sweet Trinidad and Tobago may his soul R.I.P. There goes a proud nationalist, whose passing would be missed , by most with a keen appreciation for the essence of patriotism. You saw an extremely complex country, transition from that of an insignificant colony, to Independence,and eventually a Republic ,with all the challenges that goes with it. We thank you Sir Ellis ,for your contribution to the development of T&T, and for helping us to maintain an even keel , as we grappled often with destructive forces , not to happy with our efforts aimed at achieving the true ideals of a civilized democracy. THE NATIONAL flag will be flown at half-mast until Trinidad and Tobago says goodbye to its first president and one of its greatest statesmen, Sir Ellis Emmanuel Innocent Clarke. GOVERNMENT is considering the idea of creating a foundation in memory of the late Sir Ellis Clarke. It’s 2011 , and what can one say , but let the political football games begin, as here again,as manifested by future jig and dance political chicanery, with the memory of another of our stalwart ,unselfish national heroes. Yes folks ,Sir Ellis was a great Constitutional lawyer, as well as outstanding academic and all that,but though we are grateful for this ,such means absolutely nothing to our country in terms of it’s development , and cohesive ,future aspirations that warrants immortalization, yes? Sir Ellis Clark, was first and foremost, an unswerving patriot , who gave his entire life, through national service , for his country. It is that mentality , and spirit , of putting country first over personal tribal needs , or personal financial aggrandizement, we wished to applaud, and wish that a few more nationals , would choose to emulate , as a first step to advancing our country ,further along the part to full sustainable development. Hopefully ,the people of T&T that matters ,would not allow another descendent of a neglected , yet resilient , and caring people , be caricatured, as another useless buffoon, as has been the norm , since Massa England departed these shores. Anything short of a ‘national’ glorified monument and respective days,to fully honor the memories ,of not only the first President of our Republic Sir Ellis ,but in addition ,the long deceased ,Father of the Nation,and first PM, in Dr Eric Williams , is a slap in the face of decent citizens,and should be scoffed at. Long live the memories of unsound, patriotic heroes, and long live the Republic of Trinidad & Tobago. We wish them well. Politics is politics – At the passing of Eric Williams, he’s the one who made sure ‘Indian time nah come’. It was racist not to choose the more experienced Kamal or Errol. His choice of duncy Chambers appeased the racists in the PNM – including the 2 Selwyns – Cudjoe and Ryan. Psst, if the PNM wants to win the next election they should go for Imbert. “If the PNM wants to win the next election they should go for Imbert.” No Ramjit they’ll follow Basdeo Panday ,and his ULF / UNC lead , as they too could have acquired power back in the days after the Docs demise , if they had selected ‘the great white hope,’ and our true brother John Humphrey ,the architect of Sou Sou lands , as he would have done more for the advancement of our country ,than any of the succeeding leaders ,of that party hence , yes? Now as to your erroneous , yet transparent trolling attempts, re your denunciation of Sir Ellis as being a lackey of the PNM. Perhaps the astute Uncle Clarke ,decided to put honesty ,over experience , and some would say it worked out for the best as far as our country goes when the vacuum was created in 81, hummm? Let me see ,lifetime Minister of Energy ,Sando Japanese Garden crooked oil deals, Minister of Agriculture/ Health ,ADB loans ponzi schemes ,and Ministry of Health gutting ,and stacking, as well as other double dipping escapades, every time Dr Deffy made a trip aboard ? Nahhh Ramjit,that was a great move by politically savvy Sir Ellis. Hey , only a fool would lock a fox , a mongoose , or an egg sucking, pot hound ,in the same chicken coop with gentle feathered creatures , and guess what dis first President of ours, was no fool, nor coward either , as he was in the country when the phony Islamist , domestically enabled Abu B , was attempting to run roughshod over our democracy, ennt? Now if you have a beef with any President , den wait until ‘AhH we bouy Robbie,’ exit the scene ,as he decided to get his revenge on Basdeo for destroying his government , by awarding the 2001 election to Manning. Here is an assignment for you in 2011 Ramjit , or any of your Sat Maraj, indoctrinated buddies, who wish to not only understand , but appreciate how politics is played. The last time I checked UWI was offering those Continuation Education classes , so sign up for a Political Science class or two, and while at it ,go to our modern Central library , and get your hands on a political philosophy book entitled, The Prince ,by Niccolo Machiavelli , as it might be instructive , and erase yours and others delusions. In ending Ramjit , here is the deal, we won’t tell you which tribal hero to love , worship ,and adore – irrespective of their flaws- and therefore ,would wish the same from you. By the way, enjoy this charade while it last , and or Uncle Jack decides ,he want’s his pound of flesh, two inches from a certain Queens’s political heart. Long live the memory of a proud Trini nationalist , and servant of the people , in the late Sir Ellis. Neal, Enjoyed your masturbatory replies! Have read ‘The Prince’ quite awhile ago. The person that comes to mind in reading that book is non other that Eric Williams (not a dog bark! Check how he ‘Marchiavellied’ the great CLR James and rival Karl Hudson-Phillips). He was the ‘massa’ of the PNM first and then all of TT. That Jackass Panday tried to behave much like ‘Prince’ Williams in the UNC much to his ultimate detriment. I am not a fan of both race baiting pseudo-brahmin Sat and Cudjoe. Their polemics keep them in the news much like Jesse Jackson, Sharpton and Farrakhan – psst- notice how quiet they are in the last 2 years? Ay , AY , good analysis Ramjit! I just did not know you had it in you, so there is some hope , hmmm? You are correct Panday was no Eric that’s for sure. It’s almost tantamount to Barrackpore’s Daren Ganga , trying to break Prince Lara lofty, outstanding ,batting record. It just ain’t happening in our lifetime, and would be nothing short of foolhardy, ent? You do have a point, and I must compliment youR unstated conclusions, there as well. All men are not created equal, and no way is this more applicable, than on matters of politics. Bas was a failed actor, and average lawyer , that survived until he was no longer needed , and had to be taken out on a stretcher by Uncle Jack Warner- I beg your pardon- his protege,Queen K. His initial intentions for his people were quite noble, but absolutely power corrupts, and so he swerved off the real part to nepotistic , self aggrandizement power lust insular intolerance. The Doc was a manipulative, self opinionated , vindictive, chess playing historian , who was revered ,and feared by some to scared to tell him go home and rock Erica to sleep ,and cuddle his dear wife, and so died of overwork while in office, in all his glory, honor, a ton load of mystique, as the people he claimed to care about were left to suffer, over ambitious underlings ,such as Kamal , and Errol, were allowed to get away with economic murder ,as a price for the PNM power control. Neo tribal , competing Historians would be the judge , as to who did more harm to our underachieving country. By de way ,don’t worry , the very underestimated economist com politician ,Uncle Dooke ,and his feisty legal pit bull ,Ag Rammy ,surely read the Prince, and you can bet , that they would be coming for their bit of revenge , against the UNC top dogs -past ,and present -from that cold dish, some time very soon, before 2014- and de PP Chairman, could squeal until the cows come home , as it won’t make a difference. Let’s wish our country well, and in the process, always support real selfless patriots, while respecting the memory of those gone by ,such as Sir Ellis , yes? Without him , your tribalistic country, might have fallen the way of a Sri Lanka by now , and to prove my point , you saw what happened in 1990 ,once he was no longer in the drivers seat,to lend his steady wisdom, agreed? Well, I must say that Ganga was better than Lara! As a captain – in terms of man management! As a batsman Lara falls short of Headley, Sobers, Viv and a young Rowe. His 2 records are against the weakest of England’s bowling on a flat Antigua pitch and one of the smallest grounds in the world. Sobers is the BEST batsman the world has produced, yes better than Bradman! You got to give it to the man but Panday was a superb trade unionist raising the income of sugar workers by 200%. Prince Williams responded with a 500% increase for public servants and 1,000% for dockworkers! And sugar workers still consider Panday as a god even though Caroni was pulled from under their feet by Manning – even under Panday’s watch. Look out, there is one Machiavillian in our midst – Austin Warner- That’s how we called him growing up in Longdenville. His only setback is his age – 68. It’s amazing how he graduated from the Longdenville FL, CFA, POSL, TTFA, CONCACAF and FIFA. Read his bio by Tino Singh. He has positioned himself well – in case something happens to Kamla. Yes, the Doc was certainly more feared than loved! He also ‘banished’ other rivals – Patrick Solomon ambassador to UK? and Ashford Sinanan to India. ANR made Panday minister of External affairs, right? I’m from the Dooks school of thought. In TNT he is the closest in ideology to Obama. In fact when I met Dooks in Cambridge MA about 15 years ago, he was saying the same stuff long before Obama. Check out Dooks old speeches and compare with Obama’s campaign speeches. “He has positioned himself well – in case something happens to Kamla.” Why Ramjit ,must something happen to Queen K before Uncle Jack make his move ,or try to get a return on his Queen making investments, and who would be viewed as culpable ,him or the sly Toco Forest , Mappipi snake , Suraj Rambachan ? I assume that by Dooks you mean Dookeran? If so , I like him as well, and sincerely believe, that if he was more of a political animal (so as to destroy Bas when he had the chance) in part because he dabbled with the ideas of the Prince, and less of a naive , idealistic technocrat, he would be running the show today, and would have garnered a more broad base support. Unfortunately his moment in the sun has past. It is unfortunate to see seemingly intelligent , educated folks like yourself Ramjit, still prepared to fall into the tribal adulation mode trap ,so readily ,as you give elitist , nepotist , pro cronyism ,self serving , neo colonials, such as Basdeo Panday, so much underserved praise when it comes either to looking out for the interest of his people , or pushing broad based national development agendas. Making him into some exalted hero as per Trade Union successes which are more deserving for Uncle Raffique Shah – the real hero of Indo Trinis-is tantamount , to idiotic Africans ,doing the limbo dance /dollar whine , in praise of Deffy , Eric Williams and his band of PNM cronies, for bringing free education to our country. If that is all these comedian can idly boast about after 40 years in power , then you would not like to know what I would wish for all of them ,and families. I personally would be a happy man if for the next 50 years, I never hear the name of the past five PM ‘s of our country ever again,as they are with no exception a total embarrassment, and failures ,when it came to delivering to the people that supported them diligently ,through the decades. There are other Caribbean with less that 1% of our human potential ,and natural resources ,that produced more for their respective countries, and that’s a shame. The Doc ,and Basdeo rode the backs of Africans , and Indian, then abandoned them when expedient. ANR Robinson, should be stoned each time he set foot in Tobago, for his revolting track record as an MP, and high profile politicians in the service his more adored Trinidad- for which he was rewarded with a bullet or two in the knees. 6% Chambers ,was simply a caretaker ,political peon,and a complete waste of our time, and the psychologically in-secured UWI geologist Manning,suffered lifetime bouts delusional grandeur , and so likewise squandered 40 years in politics, without bringing anything tangible to the nation as a whole. Today he remains trapped in Eric Williams ghostlike shadow, and perhaps wishes, to die in office ,in like manner, so that Sando East voters would proclaim him to be a statesman as well. That leaves the Queen ,so let’s see what the next three or less years can produce. I assume that you are very optimistic? We will see. Again , my admonition still stands,which is , “luv country , over tribe ,” my friend . There is no need to tell you why , yes? This could not be made easier in words, but his life to me was like a living legend to many, especially his family, friends, and to the many persons who crossed his path whilst alive. your loved one is home with Jesus. Thank you Sir Ellis Clarke for your contributions in life and may you rest in peace. 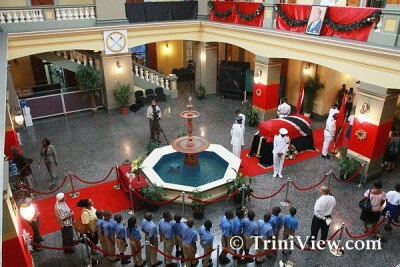 HUNDREDS of citizens paid their respects to the late Sir Ellis Clarke, first President of Trinidad and Tobago, whose body lay in State yesterday at the Red House rotunda. By lunchtime, the queue to view the closed casket bearing the body of Sir Ellis and to sign the condolence book, amounted to as many as 81 persons. Only citizens with official invitations will be able to attend tomorrow’s State funeral for Sir Ellis Clarke at the National Academy for the Performing Arts (NAPA) in Port-of-Spain, according to Foreign Affairs Minister Surujrattan Rambachan. On behalf of President Obama and the people of the United States, I offer my deepest condolences to the people of Trinidad and Tobago on the passing of their first president and last governor general, Sir Ellis Clarke. Sir Ellis was a towering figure on the Trinidad and Tobago landscape. He helped lead the country to independence. His passing will be felt not only in Trinidad and Tobago, but around the world. He was an Ambassador, a humble public servant and the consummate statesman. Sir Ellis embodied the values that we should all strive to uphold. Today my thoughts and prayers are with his son, Peter, his daughter, Margaret-Ann, and his entire family. TODAY the nation says a sad farewell to former president, the late Sir Ellis Clarke, who died on December 30, just days after celebrating his 93rd birthday. Many persons among them parents and guardians with their children filed pass the casket of Sir Ellis Clarke, TT’s first President, to pay their respects and be part of a historic occasion. THERE IS no need to rush in coming up with a fitting tribute to the memory of the late first president of Trinidad and Tobago, Sir Ellis Clarke, but it should be something that helps people, his son, Peter Clarke, has suggested. The passing of Ellis Emmanuel Innocent Clarke marks the end of an era in Trinidad and Tobago. Having lived for 93 years, Sir Ellis witnessed and, more importantly, took part in the most important events of T&T’s 20th century history. We often lambaste our children for an absence of patriotic feeling, an absence of a sense of duty. I reflect on the waning days of the British Empire in Trinidad and Tobago. On Feb 6, 1952, King George VI died. Schools were closed for the remainder of the day. The same was tue in 1947 or 48 when Prince Charles was born, a male heir to the throne of the House of Windsor. Now what did we do in our schools,to mark in the minds of our school children, the passing of our first President, a highly educated, courteous and tolerant man, a statesman extraordiniare? His was the steady voice of reason long after he left office. Children learn that things are significant, when we as adults take action to cement the occurrence in their memories, their cosciousness. I would suggest that those schools that have a flagpole and a flag, be instructed to fly them at half mast for a month, that all state buildings do the same, that children be encouraged to write essays on what he did for our country, and that teachers at all levels,in all schools remind students that this was a statesman in the highest sense of the word. Some of his writings could be read aloud, to memorialize him.In so many parts of the world,people are conflicted about who is the leader. We have never had that problem because of our system of an elected Prime Minister and an appointed President- who becoms the arbiter of last resort for our country. We can either venerate the memory of Sir Ellis, or confine him to the dustbin of history. I hope that every school, every teacher would teach students about the exemplary life of this good man. British history taught us so much about crooks like Sir Francis Drake, Sir Walter Raleigh and other conquerrors and abusers of our people. We need to begin to teach our students about our greats. We could start with Sir Ellis. Today, I read of a young man who chopped his mother on the head over the SIM card for a phone. I commented to Newsday that that was the low, the rock bottom we were trying to hit. We reached it. Now, we could use the passing of this great man, to teach students that they can be better than the hand life has dealth them. Materialism is not everything. A sense of honor, of service to one’s country, is still to be valued.Radio an TV stations can also broadcast some of his sayings and short pieces of his writings, over the next month.When something is important, to the nation, we take action to cement the event into our family’s memory. The birth of a child, a christening, a marriage, acquiring an advanced degree are marked by families. How will we as a nation, a family, mark the legacy of sir Ellis, mark it in the minds of children? A man of great integrity and class. God blessed him with long life. His passing reminds me of parts of s poem I learnt as a child back home: “Lives of great men all remind us, we can make our lives sublime, and, departing leave behind us footprints on the sands of time. As I bid farewell Sir Ellis I truly believe that “Life is not an empyy dream, Life is real, life is earnest and the grave is not its goal, Dust thou art and dust returnest was not spoken of the soul. Well done good and faithful servant! Sir Ellis Clarke – A mighty chapter in the Book of Time!! I worked with Sir Ellis back when he was T&T Ambassador to Washington in 1968. A finer, more sincere, and just man I have never met. 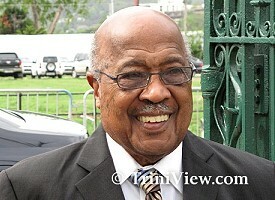 Sir Ellis was a gentleman who was kind, loved to laugh and dance and who loved Trinidad dearly. He was also a brilliant man who accomplished a lot in his life. With condolences to Peter and Margaret, and all Trinidadians and Tobagonians around the world and at home. ICONIC. This comes from the word “icon” meaning a devotional painting or carving of holy significance. Pressed by common usage though, an icon has emerged to mean a person deserving of particular admiration. Few, and short, were the tears that were shed; instead, in the short period of time between the announcement of the death of Sir Ellis Clarke and his final interment last Friday amidst the pomp and ceremony of a state funeral, there was observed, from all corners of the country, an outpouring of love, respect and admiration for the man who was and the life that had been lived. If I had to sum up the life of Sir Ellis Clarke, I would say one word: loyalty. Loyalty to a certain vision of Trinidad and Tobago, whatever the political regime, and in whatever capacity he served. He was not a Statesman: that he left for Eric Williams. He was, in fact, a Public Servant whether as Solicitor General or afterwards, even in the quasi-political position of Attorney General.